Hisanaga Seisakusho constantly strives to protect our environment and manufacture people-friendly products. The textile and apparel industry has faced concerns over the health effects of various problematic substances, but we are already manufacturing products that pass strict European inspection standards, following the fundamental concept of customer safety. We were also the first in the industry to develop a line of cyanide-free plating completely free from substances harmful to the human body. Our materials, production processes and plating all are fully compliant with relevant safety and environmental regulations. Our Chiba Factory has acquired ISO9001 certification in quality assurance and ISO14001 certification in environmental management. 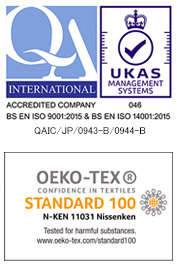 We have also received Oeko-Tex® Standard 100 certification, which is a globally uniform testing and certification system backed by academic research. We aspire to fulfill our social responsibility to protect the environment, pursue the best possible quality and enhance reliability as well as safety even further, and strive to earn customer satisfaction and trust through our business activities.